N. Murray Edwards, where are you now that we actually need you? I am not, of course, talking about the billionaire tarsands tycoon's alleged managerial brilliance or vast contribution to the commonweal of Western Canada, but to his missing voice in the increasingly bitter debate about tax policy and his role in it in this part of the world. One could argue, I suppose, that with so many people speaking for Edwards, his contribution is hardly required. But this is obviously wrongheaded, since, without his clear explanations, Edwards' apparent decision to move to London has become a tabula rasa on which we can all scratch our own uninformed opinions. Was it really taxes, or the state of Edwards' domestic life? Could it have been Calgary itself, which nowadays has all the vices of a big city with few of the graces, that drove Edwards to London? Inquiring minds don't just want to know, they need to know: Why was it, sir, really, that you decided to up and move kit and caboodle to London, England? If, indeed, that is what you've done. Whenever it took place -- the precise date is not clear- the departure for London of Edwards, petro-billionaire late of Calgary, certainly set off a storm of controversy when it eventually hit the virtual public prints a couple of days ago. Despite the best efforts of the Wildrose Party, the business press and pockets of Harperite dead-enders holed up on Facebook to pass this off as the result of cruelly high taxes imposed on suffering billionaires by Alberta's NDP and the Trudeau Liberals in Ottawa, one doesn't get the sense this theme is going over all that well. Still, give Edwards' supporters or exploiters, whichever they may be, their due. They're thorough, and they're certainly full of beans. 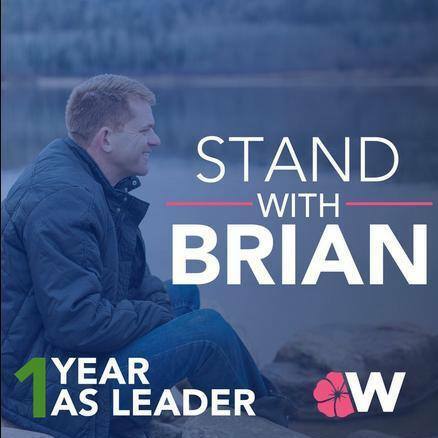 While Wildrose Leader Brian Jean sat by a lake and asked us to stand with him, prompting general hilarity on social media yesterday, Opposition Finance Critic Derek Fildebrandt was on the job as Alberta's No. 1 defender of tax-weary billionaires, decrying the way Alberta's poor oligarchs are treated by the taxperson. "The Left are the only ones surprised that raising taxes on the wealthy will drive many of them to pay their taxes in more competitive jurisdictions," the former Canadian Taxpayers Federation Alberta director huffed on his Facebook page yesterday evening. Actually, professional economists would be surprised by this claim as well, if it turned out to be true, but let's never mind that just now. Fildebrandt kindly provided a link to a windy, tear-streaked lament by the National Post's Kevin Libin about the tragic inability of Liberal and NDP governments to understand that "even one brilliant, job-creating, philanthropic entrepreneur refugee leaving Canada is one too many." It's nice to see that the long-time Ezra Levant associate -- Libin, that is -- feels sympathy for at least one class of refugee, even if this particular line of argument sounds pretty lame to anyone paying attention in a jurisdiction in which taxes on the ultra-wealthy are already ludicrously low. Meanwhile, the comments I've been receiving from readers of this blog have a different tone entirely, for the most part not particularly sympathetic with Edwards' supposed plight. This suggests there may even be a considerable amount of resentment about this story. "Edwards should take out an ad in a newspaper thanking the taxpayers of Canada for allowing him to make his billions in a safe and secure, business-friendly environment, complete with all of the publicly funded infrastructure he required to succeed in life," one correspondent wrote. "As well, he should thank the taxpayers for his publicly funded education." But it occurs to me that this indeed may in fact be unfair to Edwards, though not for the reasons suggested by Fildebrandt and Libin. To wit, in the few hours since the claimed relationship of taxes to the billionaire's departure has become an issue, about the only voice that has been conspicuously absent is that of Edwards himself. Albertans now need to hear -- in Edwards' own words -- the real reasons he decided to leave Wild Rose Country! It remains my strong suspicion that Edwards was simply tired of Calgary -- it may have seemed like the big smoke after his beginnings in Regina but, face it, a chuckwagon can only take a fellow so far, especially when it's only racing around in circles and there's no one to share the front bench. As my correspondent pointed out, Edwards owes his great success in significant part to us, his fellow Canadians, and since a lot of people are using his name to advance their highly dubious political claims, he now needs to explain to us in his own words why he has moved on. Indeed, I would go further: it is his public duty to provide answers. I look forward to his prompt response.